Modern trends in home cinema systems may favour 'virtual speakers' and the elimination of boxes, but what you gain in domestic acceptability is lost in performance terms. Yes, a 2.1 virtual surround system is undoubtedly better than nothing, but if you can run a full 5.1 rig, then you really should. 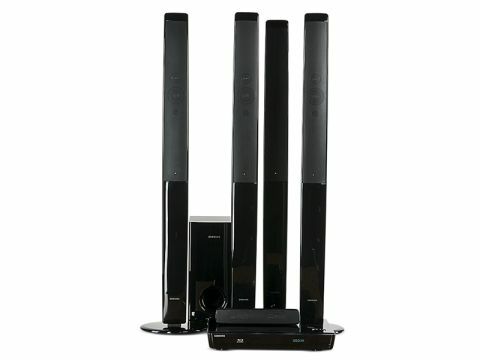 The Samsung HT-BD1255 is one such system. Comprising four 'tallboy' speakers (over a metre in height) for the front and surround channels, a compact centre speaker and an elegant slab of electronics that, amongst other goodies, features a Blu-ray player, FM/AM radio and a claimed 1,000W of amplification. Three audio inputs are provided (one of which is analogue) for digital TV boxes and consoles, but video switching is absent. Systems like this are designed for easy self-installation. And putting together the BD1255 is a simple task; Samsung has even colour-coded the speaker terminals. There is, however, one rather odd anomaly. To ensure correct speaker configuration, there's a noise sequencer that pumps each channel in turn. In this mode, though, no means of adjusting the levels is offered. They can be tweaked in a separate menu, but without the aid of sound, so you have to keep flicking between the two menus until everything sounds balanced.That's a minor moan, though – after all, once it's set up you won't need to revisit these menus until the system is moved to another room (or another house). The Blu-ray deck supports 1080p24 and BD-Live (but only with a USB stick of sufficient capacity slotted in). There's an Ethernet terminal on the rear, and those with wireless networks can plug in an optional Wi-Fi dongle. The BD1255 can also be used with Samsung's SWA-4000 – a £70 'extra' that allows the surround speakers to be connected to the main unit via radio. The BD1255's online and USB connectivity gives rise to some worthwhile multimedia tricks. The system can access clips from YouTube, and any video, photos or audio on your home network, USB or disc. Supported formats include MPEG, DivX/XviD, JPEG, .mp4, .mp3 and .mkv/x.264 files. Unfortunately, regardless of their native resolution, still images aren't displayed at anything better than upscaled SD. A modest 'home cinema solution' it may be, but there's plenty to recommend in the BD1255 – BD visuals prove to be more than a match for the average budget standalone player. No matter what you may think of the content, Disaster Movie is a visual treat. The vegetation that provides the backdrop to the Gladiator-bout dream sequence opening the film is rich in texture and warm colours, while it's possible to make out every detail in the Amy Winehouse character's tattoos and jewellery. DVDs also look good, the BD1255's upscaling giving your legacy movies a new lease of life. Sonically, I think the system punches above its weight – certainly with movie soundtracks. Samsung has endowed the front and surround speakers with separate tweeters and mid-range drivers (the centre speaker has two identical drive units), and I was quite taken aback at how dynamic and well-steered 5.1 surround was. Its only obvious downside is an unpleasantly 'thick' character to music playback, and a tendency of the subwoofer to break up at high listening volumes. There's no denying that Samsung's HT-BD1255 gives you a lot for the money – practically everything you could want is here. It doesn't pretend to approach the same levels of performance as a separates system, but for the 'non-enthusiast' I believe this is a perfect solution.